Black Chilly Entertainment presents, Nepali movie Parshuram. The movie stars Kishore Khatiwada, Janwi Basnet, Nawaraj Rawat and Swasti Chettri in the lead role. The movie is written and directed by N.R Ghimire. The release date is not yet announced for this movie. For your info, another movie with the similar type name Jai Parshuram is on floor starring Biraj Bhatt, promoting it as the come back movie of Biraj Bhatt's after the long gap in Nepali film industry. In these gap he was busy in Bhojpuri movies and he earned good name, fame and money. 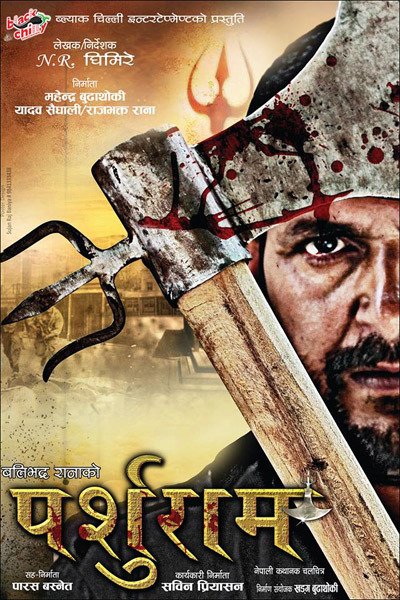 Parshuram is the action genre movie starring Kishore Khatiwada. The movie is written and directed by N.R Ghimire. Black Chilly Entertainment presents, Nepali movie Parshuram. The movie stars Kishore Khatiwada, Janwi Basnet, Nawaraj Rawat and Swasti Chettri in the lead role.